"Quality Service @ Reasonable Prices"
Here at Tutson's Landscape & Sprinklers we like to offer our customers quality and professional services. Our estimates are always free of charge and we would love to discuss any fence ,lighting and landscaping ideas to help you develop your beautiful yard/garden. We have many experienced workers in the Central Texas area that can help and assist you in many ways. Take time and browse our site. We have several images of projects in the works and ones that we have completed. We look forward to meeting with you . Our area of operation starts from Waco into Temple and continues into Belton and the Morgans point areas. Salado, Nolanville, Harker Heights, Killeen, Copperas Cove, and Kempner are just a few of the many cities that we do work in. Upon requests from many of our customers we have come up with two maintanance programs to help keep the cost down and the sprinklers systems in operation. Most Landscape companies do not have a Maintenance Program and we are the first in our area to offer this to you. Click here to read more about our program costs. Let us show you how easy it is to have a beautiful lawn. We do your job quickly and will complete it in the correct manner. Whether you are looking to install a new water efficient irrigation system, upgrade or renovate your old leaky outdated sprinkler nozzles or just need a small repair,Tutson's Sprinklers is your best choice. All our work is guaranteed. Zone-specific water calculations Different plants have different watering requirements. That’s why the ESP-SMT customizes each zone’s irrigation schedule. It factors in location, soil type, landscape slope, plant type/density, sun exposure, sprinkler type and root-depth requirements. 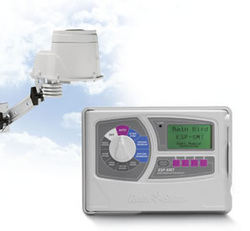 Based on this zone-specific data, the ESP-SMT controller optimizes the irrigation schedule to promote lush, healthy plant material in each part of your yard, while substantially reducing water waste and runoff.